For those celebrating the New Year of the Rooster, a happy, healthy and prosperous year to you and yours! Funny thing because the large birds have become all the rage. 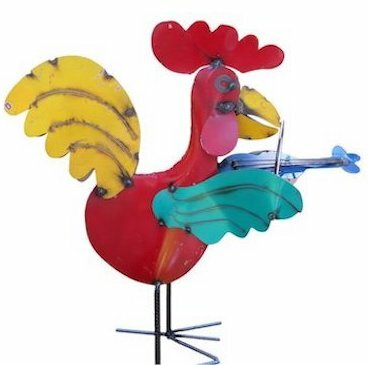 From recycled metal yard art to functional birdhouses, adorned kitchen walls and other rustic home decor, roosters are big news! This one’s kind of rustic with earthy colors and aged appearance. Raised texture adds interest to the piece as well. 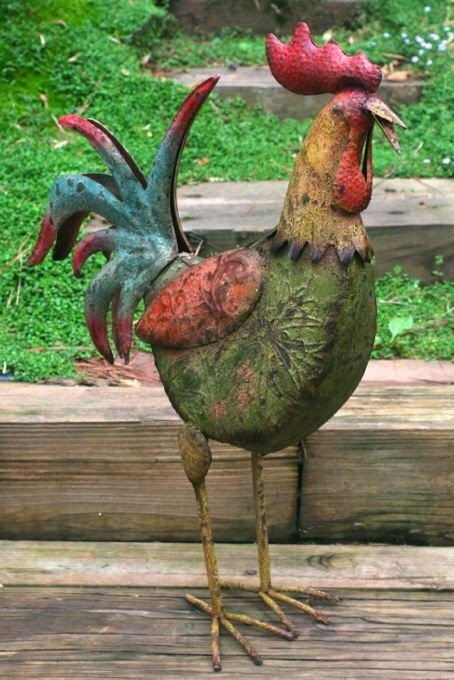 Just under 2 feet tall, this rockin’ rooster works well for indoor decor or in the garden. 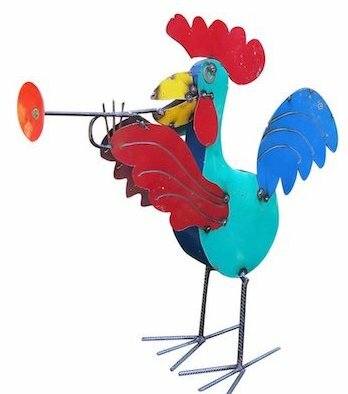 On a more animated and whimsical note (no pun intended) the Jammin’ Roosters bring smiles to young and old alike. Should you happen to know someone who plays a fiddle or trumpet, and celebrates the New Year now… omg, then these guys are the bomb! 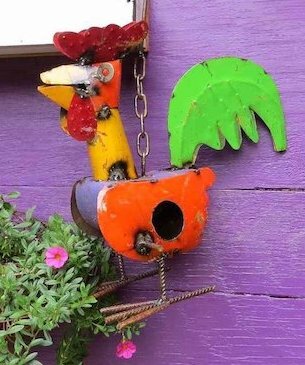 Big, bold and handcrafted in Mexico from reclaimed metal, the vivid colors will vary, though all make for some pretty awesome recycled metal garden art. Always Best when paired with a buddy! Should the preference be for something a bit more functional, the metal rooster birdhouse might be in order! He’s quite colorful, adding warmth and character to the garden. Best to hang any metal birdhouse in the shade as nestlings may fry in afternoon sun. Be sure the house is well ventilated too. Any metal decorative bird house with only a tiny entrance isn’t really good for the birds.